We have progress in matters related to Fabriano Paper! This will come as good news to all the botanical artists around the world who favour their watercolour paper as being the absolute best for their very precise and highly controlled botanical paintings in watercolour or coloured pencils. This post summarises the key points from the meeting yesterday to discuss recent changes to Fabriano watercolour paper between a number of leading (and disappointed) botanical artists and representatives of Fabriano at the offices of the paper wholesaler and distributor RK Burt & Co. My role was joint organiser and recorder of what happened. Overall the meeting was very positive and productive. While it didn't provide any immediate answers it has provided good quality information for making progress to resolve the issues relating to the recent changes that artists have identified and reported. The purpose of the meeting yesterday was to try and understand better why so many artists have been experiencing problems with the hot press papers (Artistico and Classico) produced by Fabriano Artistico. After pursuing the issue earlier in the year (see above), the Marketing Manager offered to meet up with artists who have been having problems. Katherine Tyrrell - author and writer of this blog! I'd personally like to thank all the people who travelled a long distance and for very many hours to get to the meeting. The effort I think was very worthwhile. The agenda for the day was as follows. why 90% of problems are generally found to be self-inflicted by painters due to how they handle/soak etc. plus how to avoid damaging paper (see my past blog post How to avoid contamination of watercolour paper). how to spot damage invisible to the naked eye. The company has a very wide portfolio of products and clients in terms of production and merchandising. There are vast differences between the tonnage of art paper they produce and the tonnage of other types of paper. This makes for a more robust firm which isn't going to disappear if problems occur in terms of supplies or the marketplace! The key issue that artists need to understand - in terms of how long it will take to address the problem - is that productivity and profitability is affected by how long a paper run is. For art papers which only produce a small tonnage in relative terms a paper run might only be done once a year. 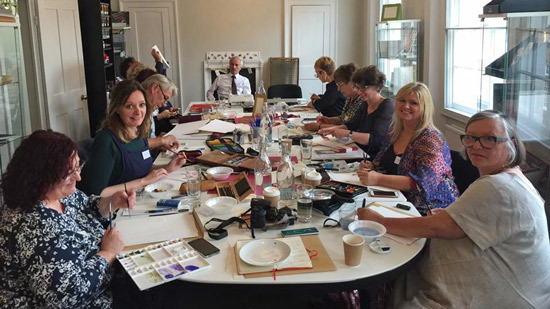 Fabriano want to try and identify the specific factors which are making a difference to the paper and the smoothness and quality of the surface and causing the issues identified by artists. There are three cylinder mould machines which can make the fine art watercolour paper and the money paper they produce. However the differences in tonnage produced for the different types of paper is immense. The cost of changing over from one to another are significant in terms of downtime and efficiency and means that the paper runs for art paper are basically done once every 12-18 months. Consequently it may take up to 18 months or so to get new paper into the retailers - assuming that Fabriano can test and identify what factors have changed the surface and performance of the paper. the samples brought and shown to Fabriano with respect to the problems. Artistico paper is made from cotton lintners. These are fine, silky, very short fibres which cling to the seeds of the cotton plant after ginning. They are needed to help create a smooth paper with strength, durability and permanence. problems with supplies of cotton linters influence papermaking in a major way (eg the 2010 flooding in Pakistan and the drought in the southern states of the USA). Fabriano decided to limit the colours they produce on the basis of the supplies which are most consistent. After lunch we started to look at issues to do with different types of paper. Artists showed Fabriano the problems they had experienced. samples of what is supposedly the same paper but came from different years/batches of papermaking and demonstrated very different characteristics in visual terms (and not just when used for painting). samples of paintings brought illustrated very clearly the problems experienced. They highlighted the differences between past versions of Artistico and Classico and the more recent versions - and the impact this had on their paintings. the way in which artists test paper - application of a single wash, working wet in wet, control of water, glazing colours one over another, lifting off, reworking dry paint, paint behaving as it should do - and what happens when you work on the other side! 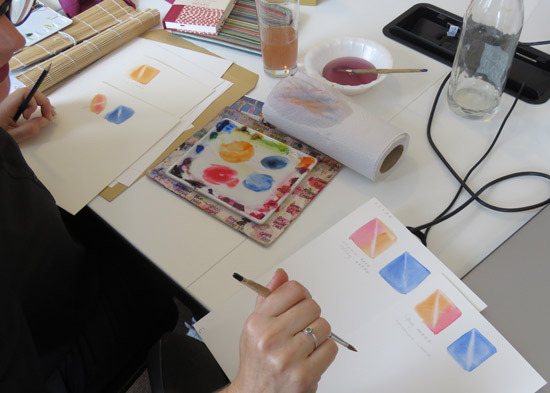 Plus ease of lay down, the use of erasers and various solvents to apply and remove coloured pencils. to compare the characteristics of other papers with those of Fabriano to enable the Fabriano mill to determine whether defined desirable characteristics were achievable. This process also enabled artists to test whether there were any other papers which might be acceptable until such time as the Fabriano papers got back to normal. to check the consistency of responses of different artists to the same papers - hence the blind testing. As a result, Fabriano came away with the view that botanical artists are probably the most demanding artists there are when it comes to testing watercolour paper! They also have a set of blind tests from several different artists - with comments. consistency across the paper i.e. a satin smooth finish which allows control is required. Glazes must also be consistent (the glazes must not granulate or streak as happened on some of the test papers). The surface must NOT fluff or break up when paint is reworked or lifted or artists work wet in wet (i.e. paper must allow botanical artists to remove paint as well as apply it). This is especially important given the number of hours a botanical artist can spend on a painting. and importantly reliability of production (the paper is always the same). No surprises! 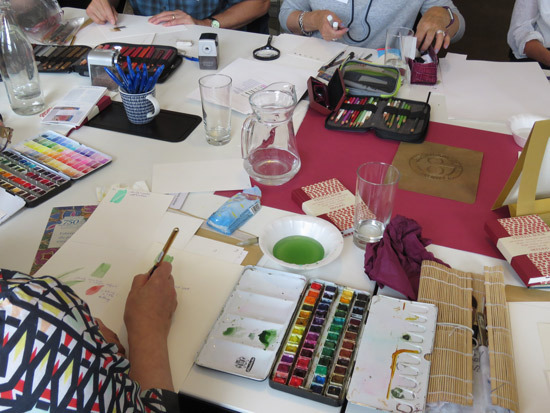 While we don't yet have the answer, I think the consensus of the meeting was that we all learned a lot about different perspectives and factors which influence the production and performance of paper and paintings - and what botanical artists need a paper to deliver. Fabriano are now much better equipped to move forward with their tests of their paper - and hopefully we will get a resolution of recent problems. It won't be immediate and it may take a while - but we are now in a much better situation than we were before yesterday's meeting. It was a very helpful exercise and it's great to have the ear of Fabriano, such a prestigious and long established firm, that has for many years offered paper that has been superb in quality and has enhanced my painting experience. The recent 'blip' although frustrating, could be a great way to perfect and dare I say improve on the historical quality. I have relished toe opportunity to work with them on the tests and look forward to trying the new samples as and when they have some. This was a great idea and although the current stock of paper is not perfect and not my preferred quality, I will continue to use it up to test my skill and see if I can still create some good work on it; I will however be praying for the return of paper perfection. Thank you very much Katherine for, firstly taking all Fabriano fans seriously enough to run with it on behalf of all of us and, secondly continue to inform us all so well. I was worried about the 'loss' of this paper and have been testing new ones up until I went away. It will be particularly interesting to read about the specifics of the tests, particularly in relation to CP work. Thank you. Thank you Katherine, it was a great opportunity to be able to meet with Fabriano and RK Burt - and to get an insight into some of the variables that can have an effect on the papers, funny really because over the years I've noticed differences from time to time and questioned whether it was me or the paper! The day explained much of this. It was fascinating to hear how similar some of our opinions were on some of the blind test papers! Like Billy I am continuing to persevere with the 'new' Fabriano, yes it's different and I'd like the old paper back but will persevere for the mean time. I felt confident that Fabriano took on board what was said on the day and took it all very seriously. All in all a very productive day! Thanks for this Katherine. I love how you say 'As a result Fabriano came away with the view that botanical artists are probably the most demanding artists there are when it comes to testing watercolour paper!' - haha! Indeed! Out of interest, did RK Burt shove a piece of the new Saunders Waterford in the blind mix? Very much looking forward to your next posts on this topic. Yes they did Jess - and it had varied comments. I'll detail more in the blog post next week about the different papers. I shall pass the "The England Team '66 of Botanical Painting" comment on to them all! Thank you Katherine for all your hard work getting everyone together and talking about paper! Who would have thought it could cause such consternation? The meeting was really informative, and I hope that the Fabriano people also felt the same way. Unfortunately there wasn't time to do anything but intitial wash testing (for me - I work quite slowly and wait for paint and paper to dry etc.) but hopefully we can complete further tests on the most promising papers as time goes on. In the meantime the search goes on for a paper that isn't too disappointing. Thank you Katherine, it was a very informative meeting and although we worked hard (Ha!) it was rather fun as well! With the 2016 batch, I got on much better on the reverse side, so if you get some of that paper, it's worth trying. I shall post a review of the day on my blog too, with some photos of my tests. Awesome, all of you to carry on in this. Many thanks, which naturally does not begin to convey all appreciation. Interesting post. I knew that art paper producers struggle with the small market they serve, but knowing that production at Fabriano runs only once every 12-18 month is stunning. Most of the art paper producers on the continent struggle and the number of production sites will go down further over the next years I guess. At present there are only 6 companies left that produce on paper machines. There are still some smaller mills that produce handmade papers,but those are usually not listed in industrial directories (St. Armand, Ruscombe or Moulin roques for example). Our local stores carry only a fraction of the available papers, mostly by market leaders Hahnemühle and Fabriano, which I consider to be the ones who are the most likely to stay. I think that artists who want or need to work over years continously with the same type of papers need a purchasing strategy to minimise the risk of running out of the best possible papers. Part of such a strategy could be to buy a considerable inventory of papers. I could imagine that especially for botanical artists who produce only a limited number of work in a year, it could be possible to stock 4-5 years of suitable and tested papers. Nevertheless one needs to keep in touch with the market to see whether suitable papers are still available and to adjust to changes. I always had a stock of 12-15 months of my standard printing/drawing paper. My last purchase was bad (two sided and uneven formation of fibres causing stripes with different tonalities over the whole sheet!). On the next purchase I am going to buy a stock of 3-4 years. I will open packages to check quality and if quality is not OK I will return it to the seller and request exchange. I am happy that the paper I need is only a fraction of the price of watercolor paper.